Set in an enchanted world backdrop where unicorns roam freely, in a kingdom ruled by Kings, Queens, Princes and Princesses (with tiara and crown!) atop a throne fun times are only a breath away with this folding Chad Valley Tots Town Princess Castle Playset. Alert the Tots, turn the music up or perhaps you'd rather listen to the serene sound birds of tweeting and frolic in the fountain spray? No matter what, this is the start of a magical night as little ones push along the unicorn carriage towards the castle. This chunky Tots Town Princess Castle playset will provide hours of imaginative fun play, ideal for all aspiring princes and princesses with lots of life-like lights and sounds and with plenty of accessories including bed, harp, two (2) chairs, a set of stairs and a table (size H35, W30, D19cm). 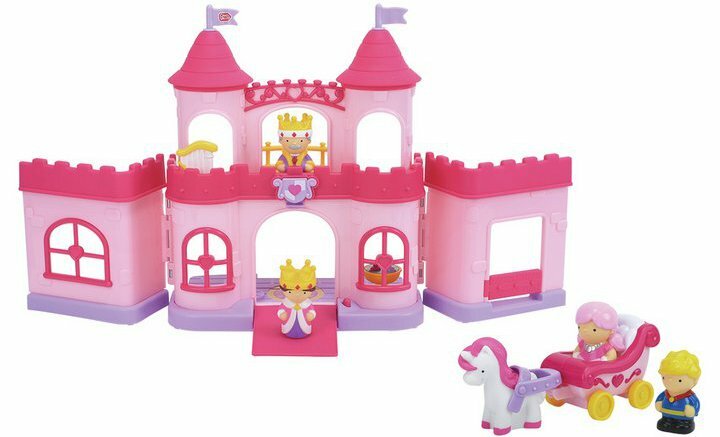 Get money off with April 2019 free Argos voucher codes, see if there's a discount code for the Chad Valley Tots Town Princess Castle Playset product.